Derbyshire is blessed with fine old houses. The grandest of them all is Chatsworth which tends to eclipse the fortunes of its less important neighbours. Hassop Hall might well fit into this category, yet it stands only a few short miles away. It dominates the small hamlet of Hassop – a gathering of small houses and a farm – two miles north of Bakewell. It stands on the hillside with spectacular views across the parkland towards the valley below. It has a celebrated history but, for the fact it has served just five families, is often overlooked by architectural historians. 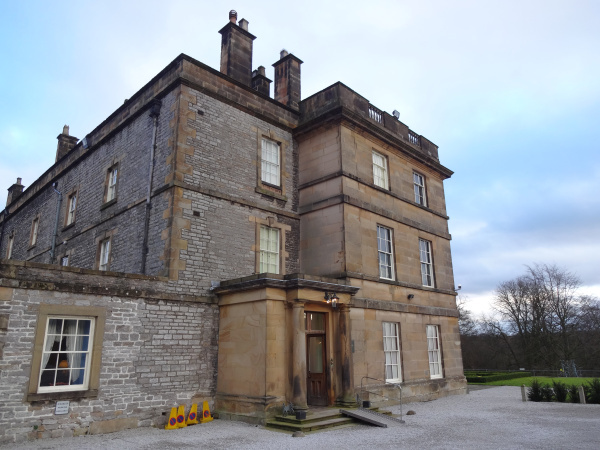 This is a shame because its origins are far more gracious than its modern re-creation as the Hassop Hall Hotel suggests. This is not to belittle the near forty years with the Chapman family because they have turned it into a gem of a property. Hassop Hall is simplistic but the south front is positively grandiose. The building is made of coursed squared limestone with an ashlar front, the roof is Welsh slated with ashlar stone stacks. This is all capped with a balustrade parapet. The house is three-storeys with 7 symmetrical bays alternately cantered to full height. The three round windows on the third floor are perceptively placed and complete Hassop’s beauty. The visitor approaches from the east which effectively shows the back of the house. However, the eye is able to take in the restored ballroom range and the dominating coach and stable blocks which make up for the lack of spectacle. The original house was in the Foljambe family. The house then passed through marriage to the Plumptons until the late 15thcentury when it was sold to Catherine, the widow of Stephen Eyre. During the Civil War Rowland Eyre turned it into a Royalist garrison and the house was the scene of several battles. After the Parliamentary victory the house was captured and had to be redeemed at a cost of £21,000. By this time Rowland’s father had dismantled much of the old hall and replaced it with the present one. Thomas Eyre later rebuilt much of the house between 1827 and 1833 in an L-shaped plan and moved the entrance from the south side to the west. 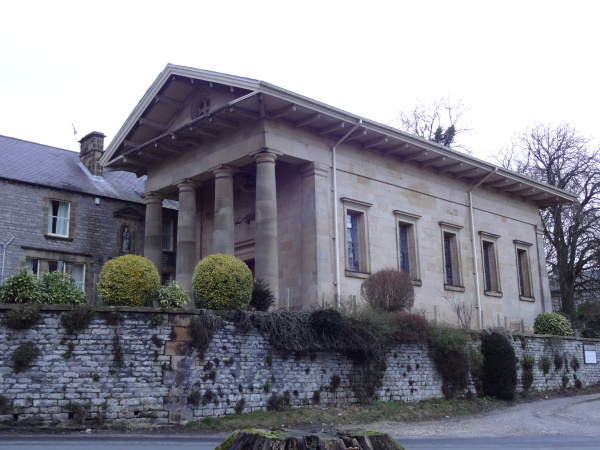 He also built the impressive stable block and coach house to the north and the long ballroom above the dairy. The estate eventually passed to Dorothy, sister of Francis, in 1852 and then to her widower, Colonel Charles Leslie, a year later. The land around Hassop had always been rich in minerals and the Eyre family had made their fortune by mining. Lead was their biggest source of income and it is reputed that today there are two large manholes in the floor of the cellar that lead to one such abandoned mine. Other income was derived from fluorspar and the lesser known chert (this was transported to Staffordshire for pottery making). By the start of the 20th century Hassop’s fortunes were on the decline. After the first world war the house, like many others, stood empty and in a poor state of repair. 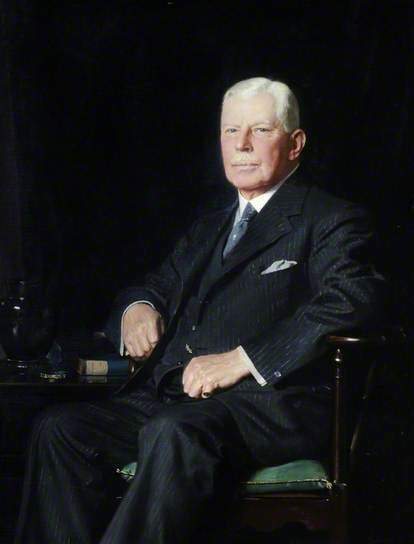 It was the intervention of Colonel Henry Kenyon Stephenson (1865-1947) who managed to revive its fortunes. He bought Hassop Hall from the Leslies in 1919. Sir Henry Kenyon Stephenson. Portrait courtesy of Sheffield University. Stephenson was a man of great resources and titles. During his lifetime he was the Chairman of Stephenson Blake, the Sheffield type foundry, an MP for Sheffield (Park), the Lord Mayor of Sheffield, the High Sheriff of Derbyshire and a Pro-Chancellor at Sheffield University. He would later become the 1st Baronet Stephenson in 1936. It was Stephenson who brought the house back to life and introduced electricity and modern plumbing. Hassop would pass to Stephenson’s son, Sir Henry Francis Blake Stephenson (1895-1982), the 2nd Baronet. During 1953 he made alterations to the house including the removal of the top two floors of the north-west wing. It is unsure as to the state of the house’s fortunes at this time but they may have influenced Stephenson’s decision to sell in 1975. The new buyer was Thomas Henry Chapman (1939-2013), formerly of the Waterloo Hotel at Taddington. His previous occupation would have been a sign of things to come for Hassop Hall. Chapman purchased the house, but not the estate, and within months the house had been converted into a luxury hotel. Four decades later it remains in the private hands of the Chapman family and thrives as a wedding and conference venue. The interiors have been elegantly maintained. The Morning Room and Drawing Room have carved marble chimneypieces by the geologist and stonemason, White Watson, from nearby Ashford-on-the-Water while the green Sitting Room has a marble Tuscan fluted chimneypiece with marbles inset. The hotel’s steady management has also allowed the restoration to other parts. Over a twelve year period the derelict brew house, buttery and ballroom have been tastefully renovated. 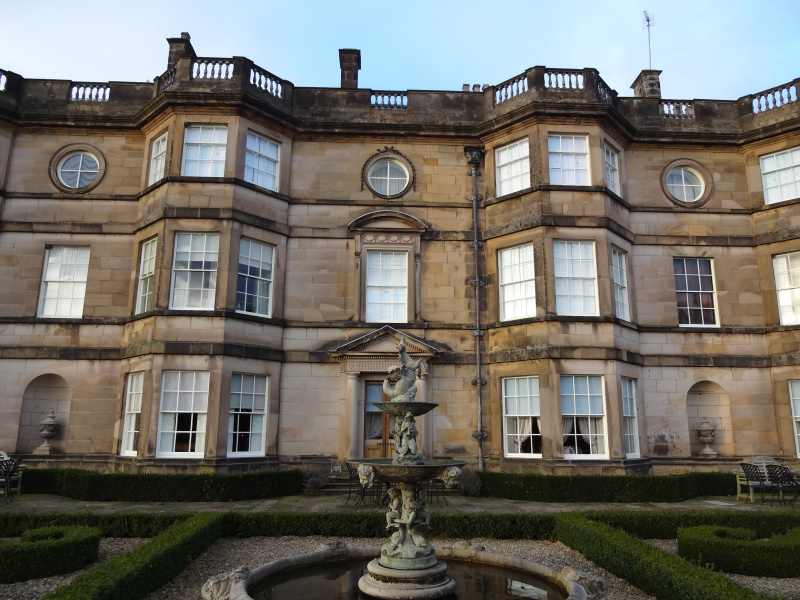 The 18th century Camellia House is being converted into 6 hotel suites. The age and beauty of Hassop Hall makes it a quaint location. It thrives on stories of ghosts and phantom carriages. The mysteriousness is heightened with its underground passages. One such vaulted passage leads from the main house to the ballroom range. Other hidden passages lead down to the lake, the church and extra cellarage in the park. We cannot leave Hassop Hall without mentioning the church which stands at the bottom of the main driveway. This was built between 1816 and 1818 in a classical revival style, no doubt influenced by Francis Eyre’s Grand Tour of Europe. The Roman Catholic Church of All Saints was designed by Joseph Ireland and is said to be based on Inigo Jones’ St Pauls Covent Garden. He was assisted by his then apprentice, the architect Joseph John Scholes. The church is built of stone from a Baslow quarry which would have been transported to Hassop using the turnpike road of 1745 when toll charges amounted to £10. It was later restored in 1886. Today it stands menacingly above the road with the front resembling that of an Etruscan temple, the interior rich with a coved coffered ceiling.